I’ve read two articles this week that really inspired me – but they weren’t what you might expect. In both, the writers were honest about their struggles, and it was their authenticity, rather than any pleasantries, that brought me encouragement. The first was this post at http://lifeofasinglechristianwoman.wordpress.com/2013/10/17/it-is-not-good-for-man-or-woman-to-be-alone-part-2/ which follows on from earlier posts about being single, particularly in Christian environments. Although you may think it is only relevant to Christian readers, or only to singles, I believe this is something we all need to read and consider. The writer suggests that we were not made to live in isolation, and stresses the need for community. As you will see, I’ve put an essay of a comment on as it really got me on my soap box!! The second was an article in ‘YouthWork’ magazine called ‘Broken Dreams’, page 15-16 of Vol. 2 Issue 34 (Oct ’13). This is one of the most honest accounts of Christian Youth Work I have read and it encouraged me that I’m not the only one who sometimes finds it a struggle! I don’t have to deal with anything like the difficulties or disappointments that the writer faced, but the fact is that youth work is a long haul thing, in which kids may transform overnight from having loads of issues to none, they may all listen perfectly, they may all tidy up after themselves, and other church members may ‘get it’ straight away, but they probably won’t. The writer talks about something she and her husband tried to do that ultimately appeared to fail. They felt ‘called’ by God to do it, but still it fell apart, and she is still processing what happened and trying to make sense of it all. I recently had a similar disappointment where it felt like all my hard work had been in vain, and where something I had put my heart and soul into seemed to crumble. I was heartbroken. The only way I could make sense of the fact that I had poured my whole self into something that seemed to fail completely was that I had learnt to love a little better and a little more selflessly in the process. I’m becoming more and more convinced that this is the one thing that can make life mean something when everything’s hard and nothing’s as we feel it should be: that my life’s goal is to love God better and love other people better. I was thinking this sounds a little idealistic, but as I racked my brains for a situation in which it could not apply, I found none. Even in the midst of horrific wars or disasters, there have always been stories of love, sacrifice, faith and compassion. Love really is the answer and the aim. It doesn’t really make things easier – love can be a painful and consuming thing – but perhaps it does at least make things a little better. It also completely changes our understanding of success, because in each new initiative we take, our idea of success in it is not necessarily that it will ‘work’, but that we will come out of it more loving than we were before. 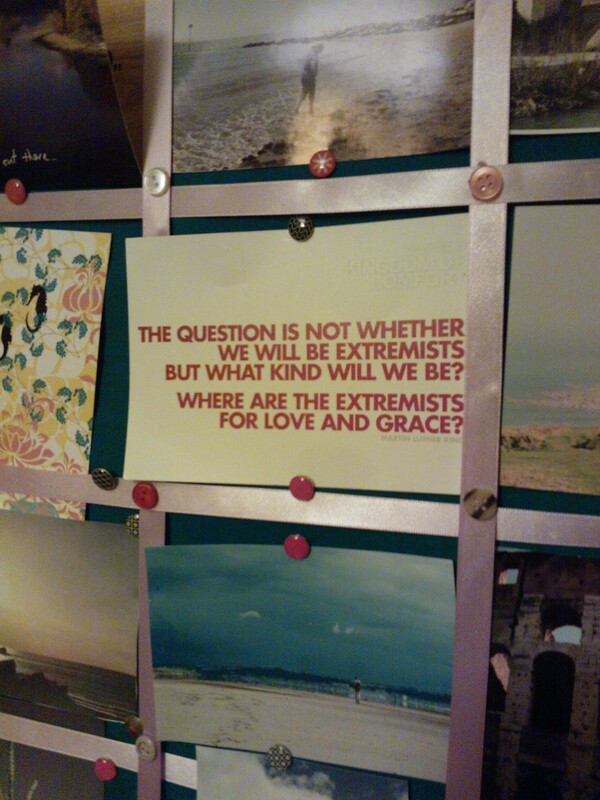 Martin Luther King famously asked ‘where are the extremists for love and grace?’ I wonder where life as this kind of extremist might take us?